This 3BR/2.5BA condo is the perfect beach-centric retreat for up to eight guests. The expansive layout offers plenty of space for everyone to stretch out, and the back patio features a shared pool, hot tub, and kiddie pool. The culinary-minded folks in your party will adore the large kitchen, equipped for making everything from quick beach snacks to sophisticated dinners. 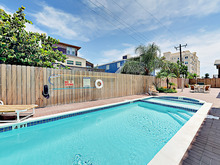 This prime South Padre Island location puts you right in the center of the entertainment district and a 2-minute walk from the sand. Outside, a shared patio offers loungers for soaking up the sun around the pool, a table and chairs for outdoor meals and drinks, plus a kiddie pool and hot tub. This breezy outdoor space is fenced for privacy. Inside, stylish details add charm to the living room, which is furnished with a sleeper sofa, recliner, and comfy club chair. Watch your favorite shows on the 40” flat screen. A private balcony invites you out into the sun. The expansive kitchen has ample counter space and new appliances. Serve masterful meals in the dining area, where a dramatic sun-drenched wood table seats six. The convenient half bath off the main space is modern and bright. All bedrooms are located upstairs. In the master bedroom, sleep soundly in a king-size bed. Watch movies on the 32” TV. The bath features a walk-in shower with decorative tile work. The second bedroom is furnished with two twins; guests in this room have access to a private balcony. The third bedroom also has two twin beds. The shared bathroom on this floor offers a tiled walk-in shower. Extras include reserved parking for two cars (parked in tandem), laundry facilities, and complimentary Wi-Fi. Inquire about the ten other in-complex units if you're traveling with a larger group.